WHAT can we say? Cyanogen's latest move is very troublesome. We have warned about this for a very long time, but much of the press played along with Microsoft’s plot (covering Office for Android), propping up Cyanogen etc. So, what do we do now? Microsoft has nothing to fear but an informed public (or truth itself). The sooner people realise what Microsoft is up to, the sooner they will reject Cyanogen and stop buying from Samsung (we called for a Samsung boycott way back in 2007, right after Samsung had signed its first Microsoft patent deal covering Linux). “If Microsoft bought Cyanogen, as some people had speculated, it would harm its ability to pretend ‘independence’.”Several readers have sent us links about Cyanogen. My wife says Cyanogen’s interest is “just making money, they don’t care about privacy or people’s concerns.” Richard Stallman asked me today for more information (having read my previous articles) and the better familiar we are with this circumstance and the underlying facts, the more effectively we can challenge this “Embrace, Extend, Extinguish” (EEE) manoeuvre from Microsoft. A Microsoft-linked site weighed in on Friday, explaining to readers how Cyanogen is essentially a Microsoft proxy. The article titled “3 Companies Are Helping Microsoft Corporation Steal Android From Google Inc.” It also names Samsung and Amazon (many executives from Microsoft moved there, including those who manage the Linux efforts, such as Kindle, and ended up paying Microsoft for Linux). The section about Cyanogen is titled “Making Android-powered Windows Phones”. That’s a good description of Microsoft’s goal. 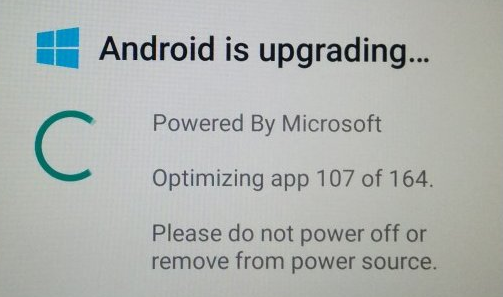 As a kind of FUD advisory, one ought to know that Microsoft has gone “full frontal assault” mode on Android. It’s usually done through proxies, e.g. biased publications with Microsoft boosters who are shamelessly misleading audiences. Here for example is some Microsoft propaganda from Microsoft’s booster Matt Rosoff (yes, he is still around). It was published yesterday. It used deception/false charts, big lies, shameless PR, and ultimately sought to mislead Google, mischaracterise Google, and incite readers. It’s disguised as analysis, but being from Rosoff (a loyal Microsoft 'analyst'), one oughtn’t expect it to be honest. What Rosoff provides is not advice for Google (the headline says “It’s time for Google to throw ‘open’ Android under the bus”), Rosoff has been a Microsoft propagandist for many years and his words should be treated accordingly. Rosoff is offering a trap, misguided ‘ideas’ that would essentially help his friends at Microsoft and get Google in a lot of trouble (e.g. in China, where promises have been made). The anti-Android propaganda (not just the above) is all in sync; in Europe there’s talk of antitrust (after Microsoft lobbying and pressure through proxies like Nokia) and then there’s the bribe for Cyanogen to sell out (official announcement here). They want to pretend that ‘evil’ Google must be destroyed and Microsoft will be our ‘saviour’. All of this happened almost on the same day, so there is probably no coincidence in timing. It looks like a strategic alignment of announcements that exploit people’s emotions and put forth a misleading storyline; while Microsoft lobbyists are misleading regulators Microsoft is proposed as the ‘solution’ by Cyanogen and while regulators slam Google over many things (some legitimate, e.g. privacy) Cyanogen steps forth to ‘help’. Microsoft is trying to pressure OEMs — using threats of litigation or bribes — to preinstall Microsoft (and thus drop Google), all whilst EU press (and by extension the international media; see the New York Times article “Microsoft, Once an Antitrust Target, Is Now Google’s Regulatory Scold” further down in this post) attacks Google for being so unbelievably evil (even compared to Microsoft). Microsoft is about as evil as ever, if not worse. The fact that it hides this behind a grin and massive PR efforts (lies) won’t change that. We already see some large media sites helping Cyanogen (explaining to people how to replace Android with ‘Microsoft Android’) and promoting Microsoft’s narrative. We, in response, ought to work hard to make sure Cyanogen has not a single partner and that people don’t ever install it. We called for a boycott quite some time ago and shortly afterwards OnePlus dumped Cyanogen ([cref 82427 there is more to be done by OnePlus and its users). That’s untrue. Cyanogen is imposing or at least pushing Microsoft software, it is not offering choice. Cyanogen is now a proxy of Microsoft. If Microsoft bought Cyanogen, as some people had speculated, it would harm its ability to pretend ‘independence’. Does Anyone Still View Cyanogen as Anything But a Microsoft Proxy?